Beauty Costs > How Much Do Pearls Cost? How Much Do Pearls Cost? A pearl is a hard object that is created within the soft tissue of a living shelled mollusk. It is made of calcium carbonate, usually valued as a piece of jewelry. The rarest form of pearl is the natural or wild pearl which does not have any human intervention. A cultured pearl is formed via a pearl farm using a human during its natural process. The price of a pearl depends on the size, the jeweler selling it, shape, luster, color, the type and its rarity. Pearls are usually manufactured into a piece of jewelry and can be sold in different forms, commonly found as earrings and necklaces. On average, a pearl can cost anywhere from as little as $60 to as much as $20,000 or more for the rarest type on the market. Refer to our table below to see the most common types on the market, along with the costs you may pay. 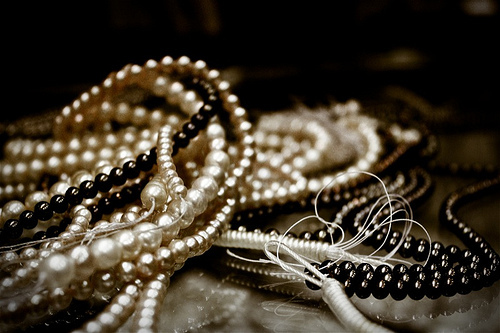 Today, keep in mind that most pearls aren’t naturally grown, but rather, they are cultured pearls that are man-made. This is the norm for most that are within the industry, and you will find that a natural pearl can be very hard to find. Round pearls will almost always be in demand since this what most people envision when they think of a pearl. However, it doesn’t mean it will be the most expensive pearl shape because some often enjoy the non-round pearls, too. The cleaner the surface looks, the more it can cost. Since it’s a real gemstone, there will almost always be a slight imperfection, even if you can’t see it with your own eyes. Touching on the surface point, the luster refers to the surface as well. Since all customers are looking for a higher quality pearl with a nearly mirror-like appearance, the brilliance is what will make it “pop,” increasing the price in the meantime. With pearls and other gems in the jewelry world, size will matter. The larger the pearl is, the more you can expect to pay. When shopping for a pearl, it will be measured in millimeters and even the slightest difference can increase the price quite a bit. Any pearl found on the retail market will be marketed as a “cultured pearl” unless it’s labeled as a natural pearl. All of the pearls noted in our table above will be considered a cultured pearl. The process will involve surgically implanting an agent that will cause the process of creating a pearl in a farm-like atmosphere. During this process, the pearl being created will be spherical in shape and will have an environment similar to its natural surroundings. Because of this process, it can be very hard for jewelers, even if they are experienced, to distinguish the difference between a natural and cultured pearl. The only way to tell a difference is via an x-ray since a natural pearl will show internal formations and stages of its growth, whereas a cultured pearl will have a solid center with no signs of growth. Pearl colors can include white, natural white, black, golden, chocolate, pink and lavender. A “black” pearl really isn’t black; instead, it’s a darker gray with shades of green and blue. If purchasing from a retailer/jeweler for the first time, pay close attention to the return policy. Pearls of Joy, the resource we mentioned earlier, said you should almost always deal with a retailer that specializes in pearls only. This way, you can talk with an expert who knows the cultured pearl market. To spot a fake pearl, gently grind the pearl across your teeth. If it seems smooth, then it’s a fake. A real one will have a gritty feel to it. Of 8,000 or so species of oysters, only 20 are able to produce pearls.